Place the food in the pots provided, place the Sport Solar Oven facing the sun and forget it. The sun does the rest. You don’t have to worry about burned food because the cooking temperatures are mild – it’s sort of a solar crock-pot. The reflector increases the amount of sunshine going into the oven. The reflectors are designed for areas far from the tropics when the solar oven competes with cold air temperatures and a lower angle of the sun. The Sport Solar Oven roasts meats, bakes fish and chicken, steams vegetables, bakes breads, cakes, and cookies. It even cooks rice, beans, lentils and pastas, with only solar energy. Using the natural moisture in meats, fish, and vegetables, the Sport Solar Oven cooks without additional water so all the natural vitamins and minerals are retained, giving food a wonderful rich flavor. See our recipe section for ideas. The Sport Solar Oven was designed by solar engineers to be used in sun rich but fuel poor areas of the world. Solar cooking can improve the quality of life and nutrition of some of the 3 billion people who lack adequate cooking fuel. People in the developing world often cook with dung, charcoal or wood which cause illness for women and children. 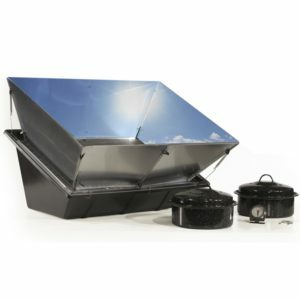 The Sport Solar Oven comes with all the accessories needed to cook, except the food! WAPI (Water Pasteurization Indicator) that confirms when water is safe to drink. Questions about using the Sport? The Sport is amazingly effective because of its innovative design features. Good insulation is the most critical requirement for a great performing solar oven. The Sport insulation has an excellent R 6.5 value. It is reinforced with glass fibers to protect it from heat degradation and help it resist crushing. The Sport insulation material will not absorb water. It is composed of thousands of tiny, sealed, air holes that water cannot penetrate. This is a key design feature because moisture is always present in solar cooking as steam and humidity. All solar ovens utilize sunlight. Most designs lack insulation in the lid resulting in heat loss during extended cooking times. The Sport lid is insulated with an innovative, exclusive, 1-inch air gap between the thicker molded lid and the taped on plastic film. Tip-over from wind, rough terrain or slope can be a major issue in solar cooking. The broad footprint and low center of gravity of the Sport make it aerodynamically and physically stable. The Sport is designed to cook in two positions: a 60-degree slant for a lower angle sun, (winter) and a 30-degree slant for direct, overhead sun, (summer). The 60-degree slant happens when the oven is placed on its back, and requires smaller pots than come with the kit. Because it is flameless, the Sport is safe for food preparation in areas where regulations do not permit fires. Camp cooks can start meals, leave the Sport to do the cooking and go enjoy the great outdoors. Solar camp cooking also saves the time and cost of getting firewood. The Sport weighs only 9 pounds, making it easy to transport to the beach or picnic site, especially compared to charcoal or gas grills. The construction of the Sport makes it boat friendly too. Its light-weight makes it easy to handle. Its rectangular shape and wide footprint make it stable and easy to stow. The plastic case, acrylic top, closed cell insulation and stainless steel hardware are tough, non-corrosive and not affected by moisture. The Sport is handy on the patio for cooking whole meals or for preparing vegetables while grilling or barbecuing. The entire meal preparation can be moved outside, reducing heat in the kitchen. Try our recipe for corn on the cob. The not-too-hot temperatures produce an amazingly tasty ear of corn, especially when steamed in the husk! What do Sport users have to say? Read some testimonials.